bands, and producers. Enjoy all the advantages that come from using professional quality studio tools and intuitive workflows! 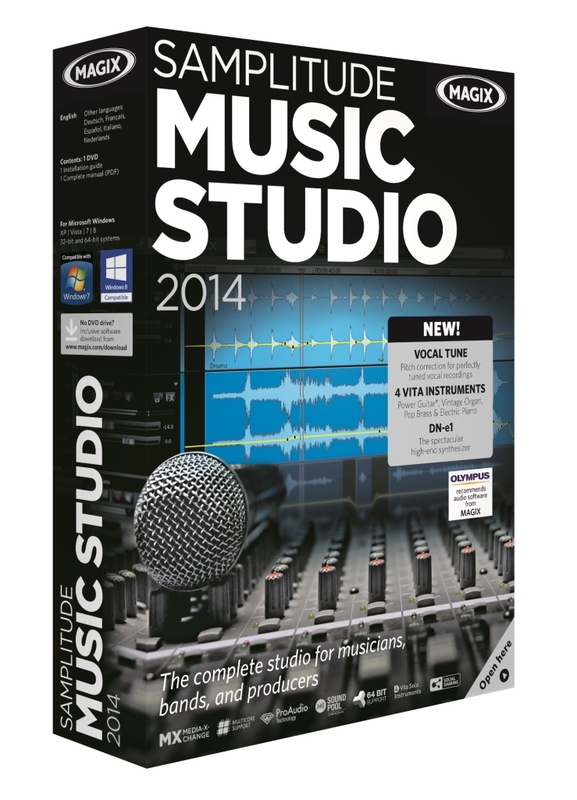 This software features multitrack recording, precise audio editing, sound design, mixing with sound effects, virtual instruments, mastering, and publishing. With Samplitude Music Studio 2014 it’s now even easier to record and develop your song ideas. Directly record vocals and instruments in high definition (up to 24-bit/96 kHz), effortlessly correct vocal pitch, professionally edit and mix your project. Realistic virtual instruments, impressive studio effects, and intuitive real-time editing with Music Studio’s 100% neutral sound audio engine provide the professional results your music production deserves. Discover amazing software instruments including: high-end synthesizer DN-e1, Power Guitar, Vintage Organ, Pop Brass, Electric Piano, Vita 2 Sample Player, BeatBox 2 Plus. Power Guitar is offered as a free download after program installation.